Last Week in Review: New and Existing Home Sales showed some solid stats in January. Forecast for the Week: Several headliner reports will be released. Which ones will land above the fold? View: Protect your hard-earned reward miles and points. “With a friend and a stick or three or four a house is built where it wasn’t before.” Carly Simon. Home sales were on the rise in January. 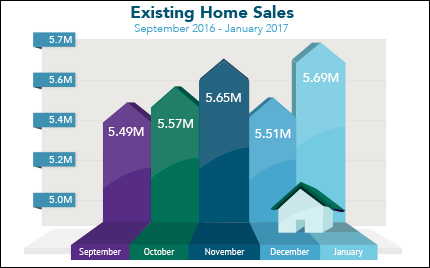 Existing Homes Sales hit 10-year highs, the National Association of REALTORS® reported. January Existing Home Sales surged by 5.69 million annualized units, up 3.3 percent from December to highs not seen since February 2007. All major regions across the nation saw gains, with the exception of the Midwest. The median existing home price rose 7.1 percent from January 2016. Overall inventory of existing homes remained low, however, at just a 3.6-month supply. The week is loaded with headline reports. Which ones will land above the fold and move markets? Pending Home Sales will be delivered Monday. Manufacturing data releases start on Monday with Durable Goods Orders. The Chicago PMI will be released Tuesday, followed by the ISM Index Wednesday. The second estimate for first quarter Gross Domestic Product will be watched by investors as well as the Fed when it is announced on Tuesday. Consumer data is plentiful with the release of Consumer Confidence Tuesday, as well as Personal Income, Personal Spending and the inflation-reading Personal Consumption Expenditures Wednesday. The Fed’s Beige Book is due out Wednesday. The non-manufacturing ISM Services Index will be released Friday. As you can see in the chart below, Mortgage Bonds prices have seesawed in recent weeks and rebounded. Despite recent volatility, home loan rates are still in attractive territory. By Lisa Gerstner, Kiplinger.comKiplinger’s interviewed Barry Kirk, who creates and consults on consumer loyalty programs for Maritz Motivation Solutions. Read excerpts from their interview below.Yahoo recently disclosed a 2013 breach that exposed personal information from more than 1 billion user accounts. Are loyalty rewards accounts vulnerable to hacking, too?Consumers tend not to see loyalty accounts as housing sensitive data. But points and miles are currencies that have a real dollar value, with $48 billion worth at stake among U.S. consumers, according to an industry study conducted a few years ago. That number is probably significantly higher now. Criminals recognize that the store of value sitting in unprotected loyalty programs is ripe for the picking. Criminals attempt to hack loyalty accounts daily. Sometimes they focus on a single account to, say, exchange rewards for airline tickets, usually redeeming them outside the U.S. Other attacks target hundreds or thousands of accounts at once. In such large-scale compromises, hackers often redeem points for gift cards, which they sell on the black market. We’ve also seen hackers use credit card accounts not only to make fraudulent purchases but also to rack up points, which they then move out of the account. Loyalty managers have kept a low profile with regard to breaches that have occurred, but it’s just a matter of time until there’s a well-publicized breach of a large program — most likely in airline or hotel rewards because members accrue significant value in those programs. Treat your loyalty accounts, especially the ones that hold the most value, as you would your bank accounts. Set aside time once a month, at a minimum, to review activity in your loyalty accounts. If you’re earning rewards daily with a program, check it multiple times a week. Don’t use the same passwords for your loyalty programs as you do for your e-mail, bank or credit card accounts. If hackers breach one account, they have a skeleton key to the sensitive data in other accounts. Take advantage of a password manager — software that generates, stores and encrypts passwords.